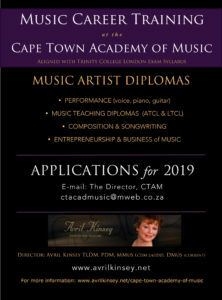 The Cape Town Academy of Music (CTAM) was founded by Avril Kinsey in January 2000 and offers personalised, quality music education. CTAM is aligned to the international exam syllabus of Trinity College London, which offers the best in world trends and syllabi for all ages and levels. Based on Ms Kinsey’s philosophy the Academy’s mission is to cater to the needs of the individual, offering discipline with creativity, and care for the person as a whole. Instrumental and voice lessons are one on one, while the professional level certificate courses also include small classes (maximum of 5 students per class of theory, history of music, songwriting, entrepreneurship and business of music, as well as music education theory and how to teach music with practical integrated teaching methods. Most lessons are once a week and are custom designed to meet the individual’s aims, needs and abilities within the requirements of the accepted levels of international graded study. There are eight grades to music, which under normal circumstances requires between 8 – 9 years. Many of CTAM’s students due to the personalised level of instruction are able to complete the grades in a significantly reduced time. A student must have completed up to a Grade 7 level to be fully prepared for music at a tertiary University level. FTCL advanced diploma requires an LTCL pass. Music Education Theory and Written Materials R3000. per term x 4 terms = R12,000. Music Education Observation Lessons R3000. x 2 terms = R6000. Music Education Practical Teaching R3000. x 2 terms = R6000. for a 50% sponsorship of the exam fee – subject to passing the mid year exam and 80% attendance. Word Editing fees for written work is calculated at 10c per word for a document. Extras: Students may add on extra modules such as teaching, composition/songwriting or producing. Trinity Int’l accredited practical and theory exam fees depend on the grade entered. The student may be eligible for a 50% sponsorship of the exam fee – subject to passing the mid year exam and 80% attendance at classes throughout the year. We will get back to you in 24 hours, except over the December holiday period when we are closed from 12 December to 8 January.